A 6-month-old infant presented with a cough. A chest infection was suspected. A frontal chest radiograph was obtained. Q1 What are the radiographical findings? The heart is normal in size and the lung fields are clear. There is apparent widening of the upper mediastinum, with a triangular soft tissue density seen projected over the upper mediastinum on the right side (Fig. 1). Q2 What is the diagnosis? This is the normal thymus gland. It can be very prominent in infants and young children. It is a frequent cause of widening of the superior mediastinum in the first few years of life. Q3 What are the radiological signs of a normal thymus in children? On radiographs of babies and children, the normal thymus is seen as a triangular structure with well-defined borders. It may blend with the heart, or have a notch between its inferior border and heart. Sometimes, it may produce an acute angle between its inferior border and cardiac outline, producing the so-called ‘sail sign’.1,2 The borders may be wavy in outline due to indentation by the costal cartilages; this has been named the ‘wave sign of Mulvey’ or the ‘thymic wave sign’.2 The right border is straighter than the left.1,2 A normal thymus does not displace the trachea or esophagus. It changes shape during inspiration and expiration, with a relative increase in diameter during expiration. Q4 What is the normal progression of the imaging appearance of the thymus? Q5 What are the causes for abnormal size of thymus? Q6 What are the other causes of mediastinal widening in children? 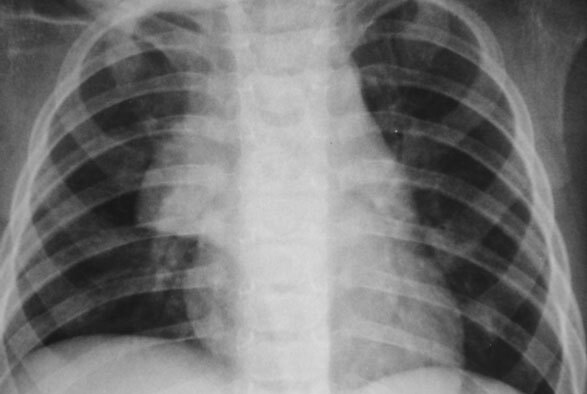 Mediastinal widening in children can occur due to a large variety of causes such as congenital (normal thymus, lymphangioma, hemangioma, thymic cyst, vascular malformation), inflammatory lesions (tuberculous abscesses, retropharyngeal abscesses with abscess extension), traumatic lesions (pneumomediastinum, hematoma, esophageal foreign body granuloma), benign lesions (lipoma, lipoblastoma, neurofibromas) and malignant lesions (lymphoma, thyroid carcinoma, neuroblastoma, chest wall tumors).3 It is important to know the radiological features of a normal thymus gland to enable differentiation from other lesions. 2	Grainger RG, Allison D. Diagnostic Radiology: a Textbook of Medical Imaging, 3rd edn. New York: Churchill Livingstone, 1997: 1309–12. 3	Castellote A, Vázquez E, Vera J, et al. Cervicothoracic lesions in infants and children. Radiographics 1999; 19: 583–600. Figure 1 Frontal chest radiograph shows a sharply demarcated, triangular shaped, soft tissue density projected over the upper mediastinum (arrow). It has a sharp right lateral border. Appearances are typical of a normal thymus in an infant.